Devour! The Food Film Fest is thrilled to be named as a finalist for the Canadian Tourism Awards (CTA) presented by The Toronto Star. We are delighted to be listed as a finalist for the Restaurants Canada & Diversey Culinary Tourism Experience Award alongside Acadian Sturgeon and Caviar Inc and The Paisley Notebook. These awards are the standard of excellence for Canada’s travel industry, showcasing our country’s best tourism products, services and experiences. This is a huge honour after marking our busiest season yet with 14+ year-round satellite events. A heartfelt thank you to our friends and partners at the Watermark Beach Resort Osoyoos BC for hosting our first ever and now longest running satellite event who are a very special part of this. And of cours,e to all the other hotels and resorts helping us realize our dream of spreading the power of food and film worldwide. 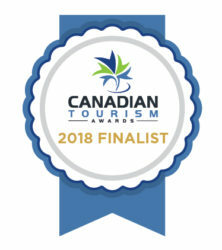 Winners of the Canadian Tourism Awards will be announced in Gatineau, Quebec on Wednesday, November 28th. We look forward to attending the ceremony and being in the presence of so many inspiring tourism operators.